A few months ago I was contacted by Darf Publishers, a publishing company 'established in 1980 in London to focus on producing books on Libya, Middle East and the Arab World in English'. '.... with the emergence of literature written by Middle Eastern and North African writers to translate and publish fiction and literary works from new talents and well established Arab writers, introducing them to a wider audience and discovering new works that wasn't given chance to see the light for many generations'. I was sent a copy of both Ahmed Fagih's Maps of the Soul and Mansour Bushnaf's Chewing Gum. This post focuses on Chewing Gum. Where to begin with Chewing Gum? 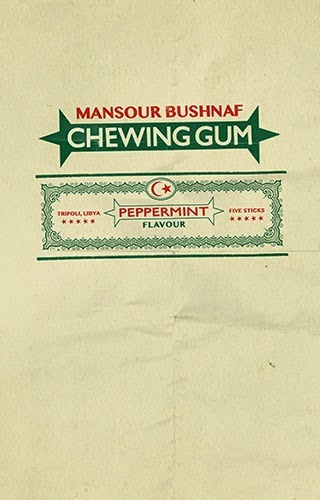 I could begin with the cover, which says so simply but effectively that the book is about chewing gum in Libya. I could begin with chewing gum itself - a fad that swept Libya according to the author. Or I could begin with Mansour Bushnaf himself, a Libyan playwright who has just published his first novel in English. Chewing Gum is a small book (120 pages) but it really does say a lot and so beautifully. Chewing Gum explores a Libyan society and its people under a dictatorship. Through the act of chewing, which is the one thing that never changes and just keeps going on, we get a glimpse at how people and place can change over time for the worse. It is also about the different groups of people - historians, philosphers, theatre directors, politicians - trying to make sense of the country. It tells the story of two young lovers - our hero (Mukhtar) and our heroine (Fatma). Our hero 'was an abandoned lover, alone beside a tree in a neglected park, unable to see anything but his beloved as she walked away' (p.5) and our heroine who not long after she abandoned our hero 'succumbed to the euphoric gum-chewing fad' (p.6). While Mukhtar remains motionless beneath a tree in a park for a decade with the world around him changing, Fatma 'found herself in contact with people she would never otherwise have known ... all for the sae of gum' (p.7). Around both our lovers, life continues (or wastes away) and we see this through numerous interconnected symbols - a statue carved by an Italian prisoner which 'inficted destruction on whichever individual became conscious of its existence' (p.20). There's also the park Mukhtar is frozen in - one of two places where our two lovers 'would talk and discover their more mature selves' (p.25). The park too had a story to tell - a story of Tripoli's many historical eras.Then there's the gum itself, or the act of chewing gum - a subject of interest for the media, politicians and academics - and trend caught on by all - male, female, young, old - which became an obsession. Even the discarded wrappers of the chewing gum garnered attention as they were used as a dating technique to trace the consumerist trends in Libya. One of my favourite part of the novel is on page 81 (pretty close to the end of the novel) and the author writes a very brief paragraph explaining the story so far and ends it with 'This is the story, and all the rest is peripheral'. I fell in love with this novel and I am amazed by its complex simplicity. Its ability to weave a tale that is equal parts beautiful, humorous and sad and make it seem so effortless. I would highly recommend this book to any and everyone and thank Darf publishers, and specifically Fergus McKeown, for giving me the pleasure of reading this book.